Toy Story Land is the newest addition to Walt Disney World! When I wrote my guide on Hollywood Studios, this area of the park wasn’t yet open. Thankfully, I was able return recently and visit Toy Story Land. I was absolutely blown away! Toy Story Land is unlike any current area of the Walt Disney World parks and is a welcome expansion to Hollywood Studios. Plus, it’s opening comes at the perfect time with Toy Story 4 set to come out next summer. 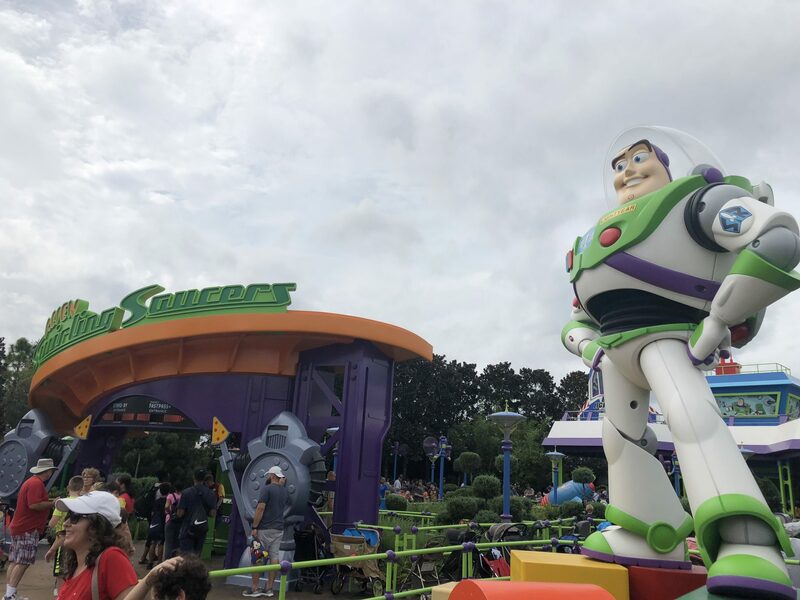 Toy Story Land gets kids amped for the series and is a welcome dose of nostalgia for the millennials who grew up watching the movies. Toy Story Land is situated in the back of the park behind Pixar Place. The entrance to the area is between the museum-style Walt Disney Presents and the old entrance of Toy Story Mania! The first thing you’ll see is a giant Woody sculpture, who stands ready to welcome you to the land of toys with a number of phrases. 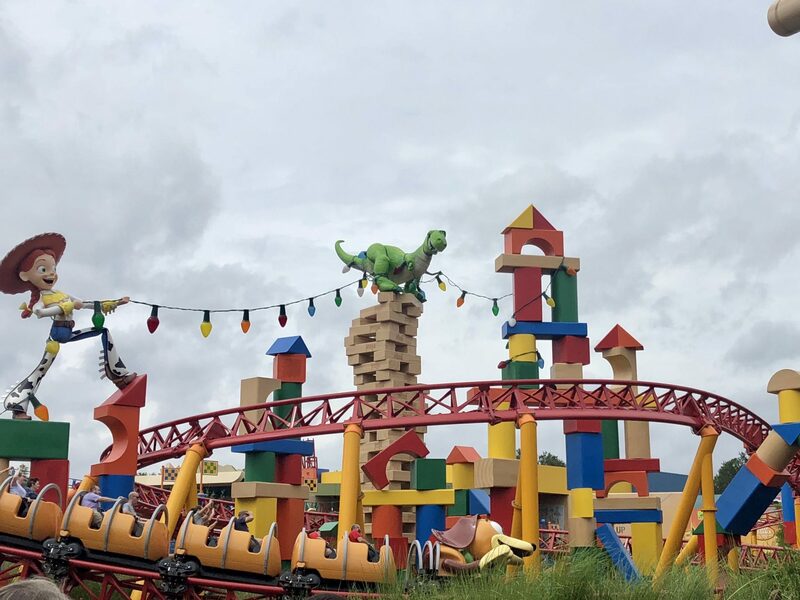 In fact, many of the toys hanging around Toy Story Land talk, which is just one of many details that sets Toy Story Land apart from other Disney park areas. Make sure you look down and see the giant footprints on your way in to the area – you’ll feel like you’ve actually shrunk down to toy size! After walking past Woody at the entrance, you’ll see Jessie and Rex stringing up lights over Slinky Dog Dash. Speaking of Slinky, you’ll be able to see him fly past if you time the entrance just right. You’ll see many giant, old-school toys as you make your way through the area, including dominos, barrel of monkeys, pick up sticks, and more! You’ll even come across the iconic (and giant!) Pixar Ball. There are even cut outs of toys who don’t have their own talking sculptures in the park, like Mr. Potato, Wheezy, and Ham. 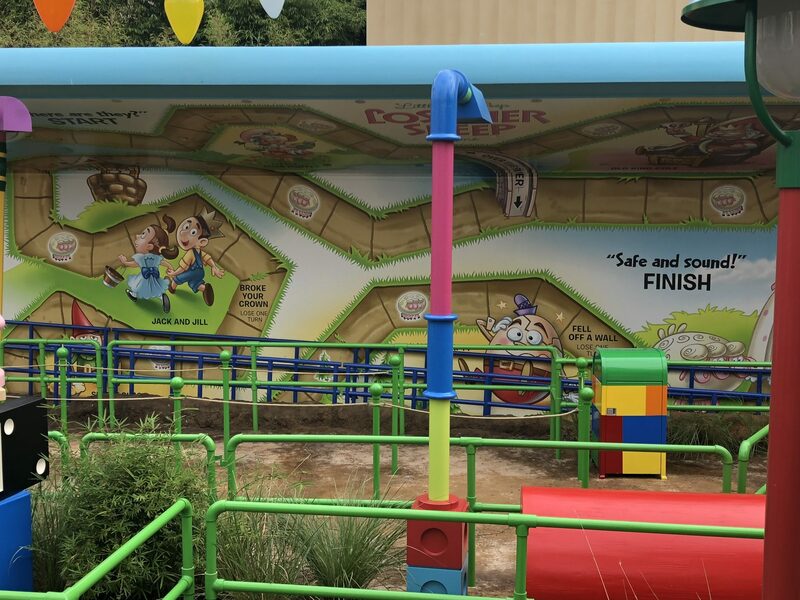 Toy Story Land has two new rides and renovated a fan favorite. First up is Slinky Dog Dash, a family friendly roller coaster where visitors ride Slinky through his world. The coaster follows the movements of Slinky’s body, with twists, turns, and (small) drops throughout. It’s great fun. There’s a special bonus for Star Wars fans, as you can spot the Millennium Falcon among the construction in Star Wars Galaxy’s Edge portion of the park (set to open in 2019). 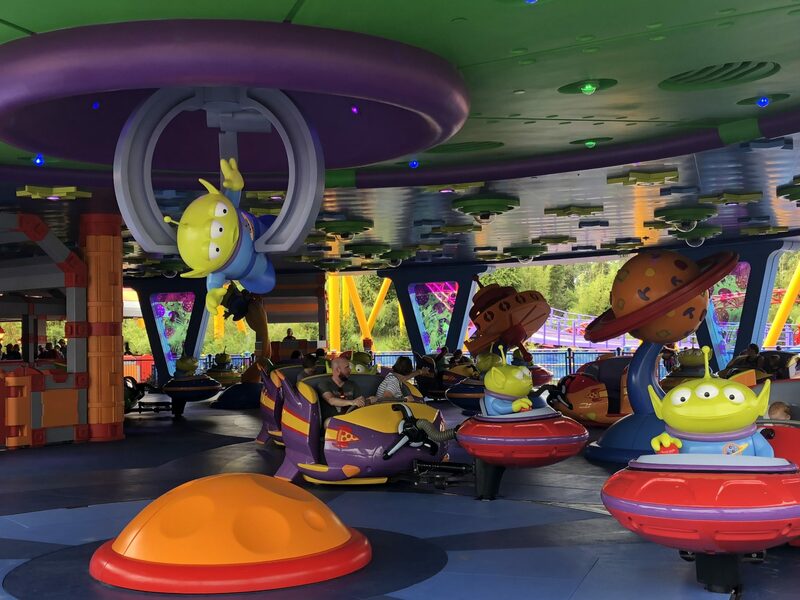 Next, Buzz Lightyear and his alien friends are ready take you on an intergalactic adventure with Alien Swirling Saucers. The ride places you in a carriage looking contraption that’s driven by one of the toy aliens. They drive in circles while your vehicle sways side to side. It reminds me a lot of the Tea Cups at Magic Kingdom, only you don’t get quite as dizzy. Still, maybe don’t eat right before riding. Finally, fan favorite Toy Story Mania! has had it’s entrance moved from Pixar Place to Toy Story Land. The content of the ride is the same, but Imagineers have renovated the ride to contain a third track, which makes the line move quickly! Visitors walk through a queue of board game themed decorations before loading up the 4D ride where they go head-to-head competing in a variety of carnival-style games. It’s a can’t miss! Part of the new queue for Toy Story Mania! Woody’s Lunch Box is the only eatery at Toy Story Land. The spot itself is super adorable, as Disney has quite literally taken Andy’s lunch box, opened it up, and created a fun snack stand. Woody’s Lunch Box is open all day, with the menu changing between breakfast and lunch. I recommend trying the “Totchos” (tator tot nachos) or the Box Tarts, which are basically like gourmet pop tarts. Woody’s Lunch Box also serves alcoholic versions of drinks from childhood (like lemonade! ), beers, and ciders. Cut-out decor in front of Toy Story Mania! 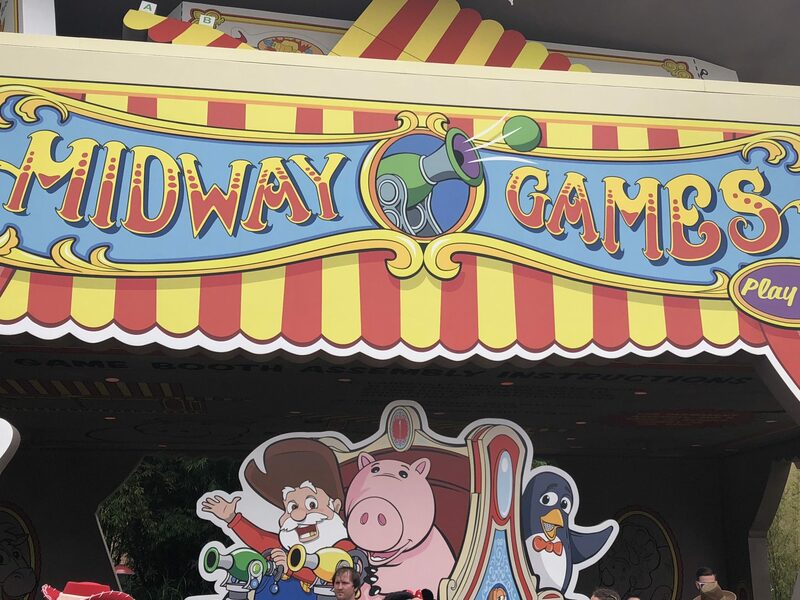 In addition to all of the fun activities I’ve discussed above, visitors to Toy Story Land can meet characters from the series and attend two crazy fun events! Woody, Jessie, and Buzz Lightyear hang out in Toy Story Land throughout the day. When we visited, they were stationed in front of some cool character cut outs outside Toy Story Mania!. Their character spot wasn’t shown on the map, so this location might change. There are two cool pop-up events in Toy Story Land. First is the Green Army Drum Corps, where Army Men station themselves in the park playing drum cadences that are sure to get guests hyped up. Second is the Green Army Patrol, a mini-boot camp with fun games and “training” led by Sarge. The times for these events should be listed on the times guide that you can pick up when you enter Hollywood Studios. The Toy Story movies have been such a special part of my life (and I’m sure the lives of many others!). I didn’t know what to expect with Toy Story Land, but Disney (per usual) managed to deliver! At Toy Story Land, you truly feel like you’re one of the toys. I can’t wait to visit again! What are you looking forward to most about Toy Story Land? Let me know in the comments below! PS: Be sure to check out my guides to Magic Kingdom, Animal Kingdom, Hollywood Studios, and Epcot if you’re planning on visiting Disney! Planning on visiting during the fall – read my guide to Mickey’s Not So Scary Halloween Party.